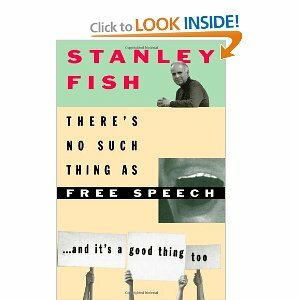 Q : Professor Fish, what do you mean when you say that there is no such thing as free speech? A : Many discussions of free speech, especially by those whom I would call free speech ideologues, begin by assuming as normative the situation in which speech is offered for its own sake, just for the sake of expression. The idea is that free expression, the ability to open up your mouth and deliver an opinion in a seminar-like atmosphere, is the typical situation and any constraint on free expression is therefore a deviation from that typical or normative situation. I begin by saying that this is empirically false, that the prototypical academic situation in which you utter sentences only to solicit sentences in return with no thought of actions being taken, is in fact anomalous. It is something that occurs only in the academy and for a very small number of people.
. . . Whichever side of this particular debate you might be on I think my point holds — there was a sense of balancing the rights of individuals to freely deliver their opinions against the desires and needs of the society and the community. Since the ’50s and ’60s that second pole has dropped out and more and more you get a First Amendment rhetoric of individual liberty which has the effect of producing a roster of First Amendment heroes, who gain that status by uttering the vilest statements that can be imagined in situations designed to cause harm, embarrassment, and psychological damage to others. These persons are then put forward as representing the best instincts of the American experiment. Spring Break was lengthy and curative. . . . So just to refresh the collective memory, comments #18 and #19 (and a few comments more in that thread) from https://haroldlounge.com/2013/03/07/the-read-from-this-side-of-suite-711-15/#comment-11194 are the roads of the moment that lead here.